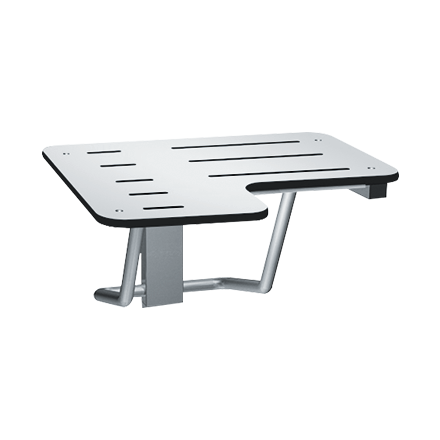 (Right Hand) Seat is 5/16” (8 mm) thick, one piece, solid phenolic, semi-gloss laminate white colored top and bottom and shall have black edges. Frame, support legs, flanges and bracket are type 304 satin finished stainless steel. Guide bracket shall control seat lowering into operating position. Seat measures 28” (711 mm) wide and projects 21” (533 mm) from wall.